I have seriously had this Craft Guide idea in my draft section for the longest time, but life just tended to pull me in other blog post directions. Since school has calmed down quite a bit, I thought I could finally get this Craft Guide published! For starters, if you're new here and have no idea what a Craft Guide is, that’s ok! Craft Guide is a series of in-depth posts designed to give you more information about a certain crafting topic. These posts are great for beginning crafters who are looking to understand a craft topic (like no-sewing) better. Today I thought I would cover a topic, which was my jam for the longest time. That topic or jam being no-sewing! Now first off, I have nothing against regular sewing! I actually contribute one post a month to a website called Seams and Scissors, which is all about sewing. However, there are those times where you just want to avoid that dreaded needle and thread. In those times of avoidance, is when you pick up your no-sew fabric glue and get stuff done! 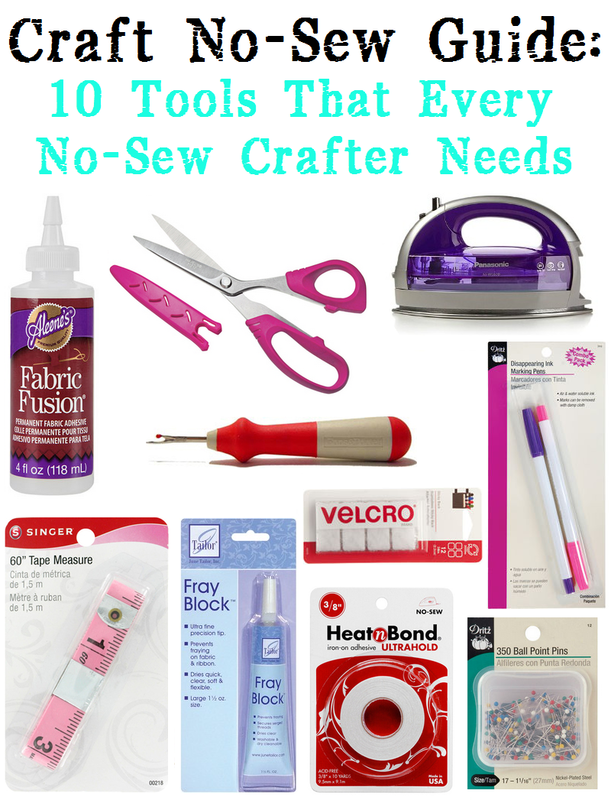 In today's Craft Guide, I will be sharing with you the 10 tools that I believe every no-sew crafter should have. Now you may be looking at some of these supplies and be thinking, these are sewing supplies! Well, no one ever said that no-sew crafters couldn't benefit from a few sewing supplies. I promise you, (if you're a no-sew crafter) everything I listed will come in handy! 1. No-Sew Fabric Glue: If thread is the main weapon in a traditional sewing box, then no-sew fabric glue is your main weapon as a no-sew crafter! Now, no-sew fabric glue comes in all shapes and sizes depending on the no-sew fabric job your trying to accomplish. In a nut-shell the pros of using a no-sew fabric glue is that (obviously) you don't need to sew, the glue is flexible when completely dried, and the glued fabric can be thrown into the washer or dryer. Like previously mentioned, no-sew fabric glue can come in all shapes and sizes. Here on the blog I've reviewed, Aleene's Super Fabric Adhesive and Aleene's Quick Dry Fabric Fusion. Both of these glues are great depending on the project that you are trying to make. However, my favorite fabric glue has always been Aleene's Fabric Fusion. This is because the glue creates a strong bond between fabrics and stays flexible after being washed. Also, the dry time for this particular glue is pretty fast. If you want to embrace the no-sew lifestyle, then I would definitely find a good no-sew fabric glue. Below I listed a few ways in which you could use the no-sew fabric glue in a project. 2. Fabric Scissors: Having a good pair of sharp fabric scissors is a must for any crafter! Whether your sewing or not sewing, having a pair of fabric scissors will make life a lot easier. Simply because you will be cutting out fabric, so you might as well invest in a good pair of fabric scissors. Along those same lines, you may even want to look into getting a pair of pinking shears, so your fabric doesn't fray. 3. Iron: You may be doing a double-take at the iron thinking, how is this a no-sew craft supply? Well, having an iron is just as important as having the fabric scissors. This is because 9 times out of 10 when you get your fabric home from the craft store, it is a wrinkly mess! In most cases, people do not want wrinkly craft projects. Also, if your using items like iron on tape, having an iron is the key to avoiding sewing. The final verdict; invest in a good iron and your fabric projects and clothes will thank you for it (lol)! 4. Seam Ripper: A seam ripper is a great help to a no-sew crafter if you're working with fabric in which you have to remove stitches, buttons, and so forth. Having one on hand is always a good idea because you never know when you may need it! 5. Fabric Marker : Having one or two fabric markers on hand is great when you're doing those larger no-sew projects. Simply because fabric markers allow you to mark your fabric, without staining or ruining your fabric. The nice thing about the fabric marker pack I listed, is that they contain disappearing ink (very spy-like, I might add)! Meaning, that within 24-72 hours, the ink will disappear from your fabric. This will then leave you with a nice clean, mark-free, piece of fabric. 6. Tape Measure: Now I won't bore you with the need for a tape measure since it's really self-explanatory. However, in a nutshell, buy a tape measure. Simply because we really shouldn't cut twice and measure once! 7. Fray Block: If you've never heard of Fray Block, it’s a wonderful product and a needed tool for any no-sew crafter. Fray Block is designed to prevent fabrics, ribbons, and other items from fraying. To use the product, you simply apply a little amount to the end of (let's say) a piece of ribbon and then set it aside to dry. Once the ribbon is dry, it should fray no longer and be able to be put into the washer or dryer. Much like no-sew fabric glue, fray block is designed to make your no-sew life much easier! Below I listed a few other scenarios where fray block could come in handy. 8. Velcro: As a no-sew crafter, you are probably trying every which way to avoid a needle and thread. With that in mind, items like sticky-back Velcro can make the dream of not using a needle and thread possible (lol)! Sticky-back Velcro is essentially what it sounds like, it's Velcro which as a sticky-back. Using sticky-back Velcro can help you to avoid sewing on buttons or zippers. It can also make a nice addition to the inside of a cheap canvas bag, if you want to create a ''little extra protection'', so your stuff doesn't fall out. Besides the ease of use, sticky-back Velcro also comes in a variety of colors and styles. Making it another tool which is perfect for the no-sew crafter. 9. Iron on Tape: Remember how I mentioned earlier that an iron is something a no-sew crafter should have? Well, this next tool proves my point. Iron on tape or iron-on adhesive is a double-sided tape which is designed to bond fabrics together without the need for sewing! This type of product is great for hemming or for those projects that you want to get done in a pinch. Now even though I'm talking about the tape, this type of no-sew adhesive comes in a variety of styles. For example, it can come in tape, sheets, or even fusible interfacing. Besides iron on adhesives, you can buy fabric tape which is not iron on. For example, here is Aleene's version of their Fabric Fusion glue but in a non-iron tape form. Depending on the project you are making, will probably dictate which adhesive you would want to use. 10. Sewing Pins: Sewing pins are a must have item! Whether you sew by hand, sew on the sewing machine or are a no-sew crafter, having sewing pins is really a no-brainer. This is because even for a no-sew crafter, you will most likely be pinning fabric together at some time or another. If you're still reading this, then you are awesome with sprinkles on top (lol)! I try to keep Craft Guides short, but that seems to never happen. So what are your thoughts on no-sew tools? Are there certain no-sew tools that you can't live without?